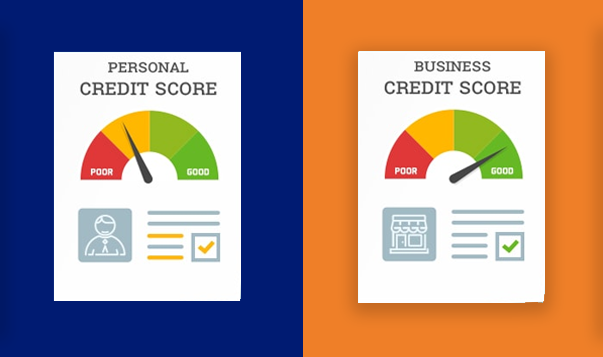 Personal Credit Score vs Business Credit Score, What’s the Difference? Personal credit score and Business credit score are two different types of scores that show the financial ability. A personal credit score is the depiction of an individual’s credibility while a Business Credit Score is the representation of the business’s credibility. The scores are usually not linked with each other unless the business is a small sized business where the owner’s personal credit score influences too. Let us break down both the scores for you to understand it better. What is Personal Credit Score? Personal Credit Score is a three digit number ranging from 300 to 900 representing your financial ability and credibility. A credit score is primarily based on the credit report information that is sourced from RBI regulated credit bureaus like CRIF. The perfect credit score to get a better credit is 750 and above. Higher the score, higher is the credit limit for your credit card, lower are the interest rates and faster is the process of getting the loan as a good credit score is ideally the best way to know one’s financial habits. A score of 650 or lower will hamper your chances to get a credit from trusted financial institutes. Simplest ways to maintain and have a good credit score is to keep a check on your credit report, paying bills on time and being financially consistent and stable. Who and What Determines Your Personal Credit Score? Credit Bureaus like CRIF assign your creditworthiness a score, using variations of the CRIF Score algorithm. ● Since paying your lenders on time represents 35% of your credit score, sign up for automatic payments for all of your credit accounts. ● Adjust your due dates according to you by requesting the banks or lenders. You don’t have to settle for a due date that is poorly timed with your paycheck. ● Aim for a credit utilization ratio of 30%. Whenever it is possible, pay off your credit cards in full month after month. A credit utilization ratio of under 30% across all cards is a sign for lenders that you’re managing your credit responsibly. ● Handle new credit carefully as opening too many new credit accounts will depict a behaviour that shows instability and every time you open a new credit account your credit score takes a small hit. ● By closing your oldest account, you may dramatically reduce your length of credit history and negatively affect personal credit score. Why does an Individual need a credit score? To have a credit score is mandatory for an individual to make sure that his credibility is not questioned when he seeks credit from the financial institutions. Having a good credit score means escalated loan process, better interest rates, bigger credit limit and faster approvals on loan requests. What is Business Credit Score? A Business credit score is a numeric representation of your company’s creditworthiness. It ranges from 300 to 900 in India. The information on your business credit report is used to produce the score, and business lenders use it when they are considering your credit application to predict the financial stability and credit behaviour. A higher score means your business has a history of paying bills on time. Who and What Determines Your Business Credit Score? ● The number of years in Business. ● Lines of Credit applied for past 9 months. ● On time payment history. ● Check your credit report at all times to keep track of what has a negative and what has a positive effect on your credit score. ● Pay your bills on time to show stable credit behaviour. ● Decrease your credit utilization ratio for reflecting a good credit behaviour of the company. ● Make sure when you pay off the debts the negative account is deleted. ● Add positive payment experiences in the payment history of the business. ● If you have a small sized business then keep your personal credit score on a check too. Why does your Business need Credit Score? A business credit score helps in separating business from personal finances. During the application process, your underwriter will take a look at additional documentation, such as bank statements or business credit reports. Keeping your finances separate is important for two key reasons, tax deductions and preventing a creditor from having a stake in your personal assets to satisfy a debt. Previous Previous post: What To Do When Interest Rate Goes Up? Next Next post: How Do Banks Assess Your Business’ Creditworthiness?